These are the perfect breakfast fare for those following a vegan diet as they incorporate carbs (potato) and protein (quinoa), and when served with an array of delicious veggies like avocado, tomato and mushrooms make a complete and nutritious breakfast. If you aren't vegan, use these in place of toast and top with a soft poached egg - heavenly! * 1/2 cup of dry quinoa (red or white is fine) will yield about 1.5 cups of cooked quinoa. To cook quinoa, first rinse it in a fine mesh sieve then place into a small saucepan that has a lid. Add 1 cup of cold tap water and bring to the boil. Once boiling, put the lid on and turn the heat down as low as it will go and cook for 15 minutes until all the water is absorbed. You will know it is cooked when you can see a little sprout tail appear on each quinoa seed and the texture is al dente when tasted. Use in the recipe from step 2. Peel and dice the potatoes into 2cm cubes. Place into a saucepan and cover with cold tap water. Bring to the boil over high heat and simmer for 5-10 minutes until fork tender. Drain well and place into a large bowl. Add the cooked quinoa, spring onion, soymilk and parsley and season with cracked pepper and salt. Mix with a spoon until combined, mashing the potato a little as you go. 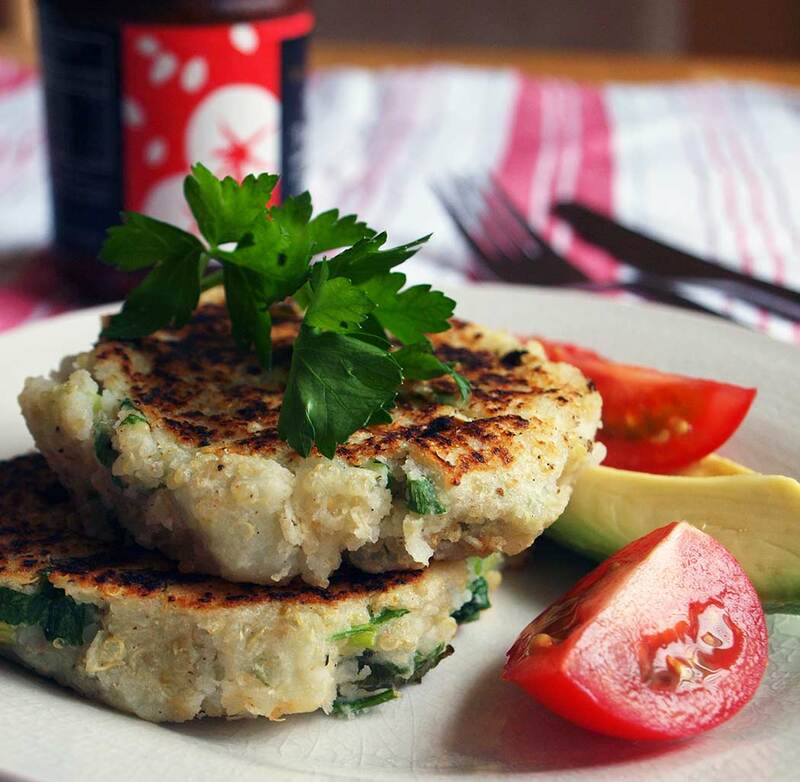 Shape into 8 hash brown patties and set aside on a plate. Heat 1 tablespoon of the oil in a large non-stick frying pan. Place 4 hash browns into the pan and cook for 2-3 minutes over medium heat until golden brown on the underside. Carefully flip and cook the other side for 2-3 minutes more. Keep warm while you repeat with the remaining 4 patties. Serve hot or warm for breakfast with avocado, tomato and mushrooms or for lunch with salad. If you aren't vegan, they are lovely topped with a poached egg.